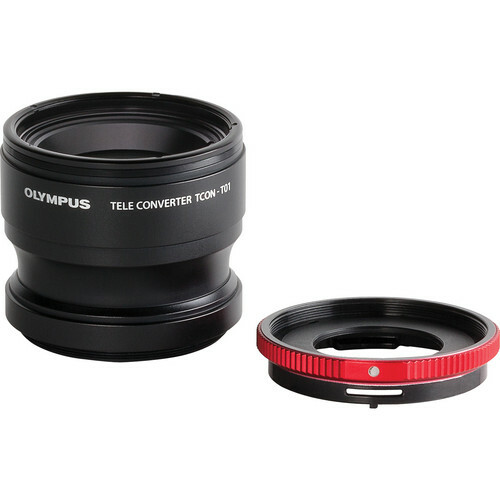 The Olympus Telephoto Tough Lens Pack contains both the TCON-T01 Teleconverter Lens and the CLA-T01 Conversion Lens Adapter for use on Olympus Tough TG-1, TG-2, TG-3, and TG-4 digital cameras. The teleconverter lens provides a 1.7x magnification increase in the camera's built-in lens focal length, extending its 35mm-equivalent focal length to 170mm. Like the TG-1/2/3/4 cameras, this lens has the same waterproof design and can also be attached to the camera lens while underwater. The included conversion lens adapter provides the ability to mount this teleconverter lens as well as additional lens accessories featuring a 40.5mm threaded connection. The CLA-T01 Conversion Lens Adapter by Olympus has been specifically designed for the Tough TG-1 iHS digital camera. The adapter enables the easy attachment of the FCON-T01 fisheye converter lens or the TCON-T01 teleconverter lens for expanding your photographic horizons. Its mount accommodates any 40.5mm filter to further allow your creativity to flow. Box Dimensions (LxWxH) 4.1 x 3.3 x 1.8"
Compatible Camera Olympus Tough TG-1 and TG-2 iHS digital cameras. CLA-T01 conversion lens adapter is required.